At Mundus Journalism, we understand the importance of connection. So as much as this degree is about connecting journalism, media and globalisation, it's also about connecting people and building global networks of like-minded peers and colleagues. Hence, the feeling of connection is encouraged from day one and creates a strong bond between students, alumni and staff, who quickly come to identify themselves as a part of the Mundus family. This idea of connection is so integral to the philosophy behind the programme that our people even play a prominent role in all aspects of this website. 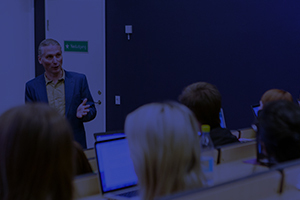 Most photos on this website, for example, have been taken by our talented students: their brief, as you can read about in the collaborations section, was to capture their experience as a Mundus Journalism student and translate that into images that we can now share here. 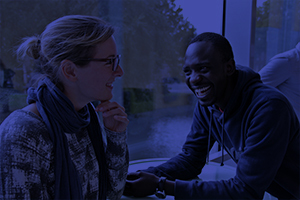 And the home page image is no different: it features our esteemed Aarhus University colleague Associate Professor Teke Jacob Ngomba, who is himself an alumnus of the programme, chatting to student Freja Erikson at our 10-year anniversary and reunion in Amsterdam 2015. The reunion was also a collaboration within the Mundus family. 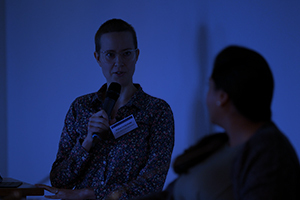 The event was managed by an alumna from our inaugural year, Audrey Sykes, and coordinated by members of the Consortium and student assistants from University of Hamburg. These are just a few of the professional relationships that we are proud to have been able to foster through our networks. On the Mundus family subpages, you can read more about the people - and the ideas - that have shaped, and continue to influence, our unique and growing network.